Before you ‘Ask the Expert’ please read through some of our top frequently asked questions. Your question may already be answered. What does XYZ mean, I don’t understand a removal term? How many days will it take to move me if I am moving overseas? This really does depend on a number of factors. The volume of possessions to be moved. Whether you have decided to pack yourselves. The access challenges at your property. 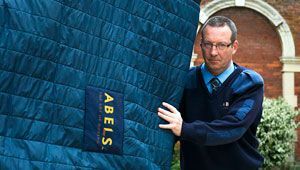 It is best to call our head office on 01842 816600 or email shipping@abels.co.uk where we can discuss your move further. We are a logistics provider, the terms removal company does not really describe the full extent of our services. From UK Domestic Removal and Storage Services, European Moving and Storage to International Relocations with our FIDI Faim quality accredited worldwide partners. An award winning BAR approved Training Facility to train the industry – where removal men are trained in a purpose built house, so they practice on our possessions, not our customers. Home delivery services for clients such including John Lewis and Marks & Spencers. Hotel installations and FFE. Commercial and Office Moving Services. There are very few items that we have not moved. Who arranges the parking bay suspensions? This is often part of the service and is quoted separately within our quotation. Should you prefer to make arrangements yourself – it is usually your local council who deals with this matter and there details can be found through their website page. How early should I be planning to make arrangements? It is never too early, (however if you do look say a year ahead then currency and fuel fluctuations, cost of living, shipping and airline charges can all effect the price). In an ideal world you should be calling in quotations 2-3 months prior to your planned moving date. This will give you ample time to show the company around, receive in quotations and then book your move with time to spare. How do I prepare for my moving day? It’s never too early to make a start. Even though our packers are experts it’s still a good idea to start sorting out the essentials well in advance. Attics, cellars, garages, sheds all need to be cleared of items that are not to be moved, appliances need disconnecting and fixtures and fittings dismantling, refrigerators and freezers require defrosting and outdoor equipment thorough cleaning (unless these items have been included within our proposal to you). Ensure that you separate out items that you don’t want to be packed including essential travel documentation. Are the removal men fully trained and security checked? How can I get a quote for a select number of items? I have a full house / majority of a house to be moved, how can I gain a quote. We would always recommend that a home survey appointment is made to discuss your specific move, look at the access to your property for a large vehicle, the walking distance from home to where the truck can position, number of stairs to be negitiated and assess your possessions to be packed and protected during transportation. 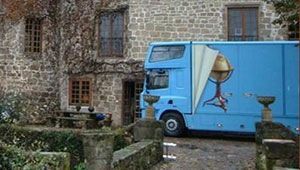 Why should I pay for a professional removal company? Time is the biggest factor to consider. Packing will take many many hours and can be a physical challenge as well moving the cartons around as they will need to be stored in your home while you pack. The loading is extremelly physical and a skill to position items where they will not damage one another and remain secure. The costs of purchasing your own materials, hiring a suitable vehicle and the fuel required can quickly become higher than expected. 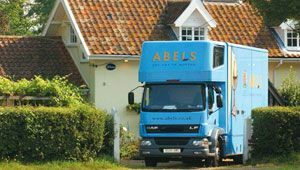 A professional removal man will pack quickly and not be side tracked by the day to day or items they are packing, with a team of two three or four men this processess is quickly achieved with loading, transport and delivery all part of the service. 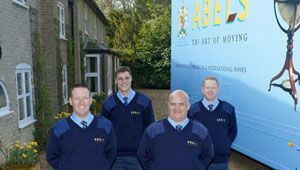 Training of the removal men is of paramount importance and at Abels our removal teams spend at least a week within our training department learning the basic skills and will then return year after year for refresher training. Insurance is also a consideration with many insurers refusing to cover DIY removals, therefore any damage is down to you. What items can I not ship in my container overseas. The containers are 7 ft x 5 ft x 7.5 ft high. Total capacity is 250 cubic feet or 7 cubic metres, however realistically work on 230cuft / 6.57cbm as space will be lost as furniture does not fit together without some space being lost. These are standard removal industry size, ideal for fork-lifting on and off vehicles allowing us to load and unload directly at your premises resulting in minimum handling. 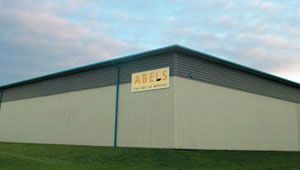 Visit www.abels.co.uk/storage-services for more information on the storage process. What transport methods are open to me? This is the most common mode of shipment. Household goods are export packed and stowed in steel water-resistant containers. Containerisation of cargo is the key to safety. Containers travel secured in an upright position on modern purpose-built vessels. The normal internal height is 8ft, so even the tallest items of furniture remain upright and contents rarely shift. With rear doors that are customs-sealed, the containers are virtually pilferage-free. 20ft (feet long) (1050 cubic feet capacity, which will apply to a typical 3 bedroom home and a minimalistic 4 bedroom home) and 40ft (2100 cubic feet capacity, which will apply to an average 4 to 5 bedroom home) Service are available to most destinations around the world via direct sea transport and inland haulage where the city / country is land locked. Larger 40ft (long) High Cube (2400 cu ft capacity) that have an additional height to a normal 40ft container of 9ft their entire length – hence the term High Cube! Or 45ft Super Cube containers (2700 cubic feet capacity) are also available on selected routes where vessels allow. These are as the name depicts 45feet in length. This information is not definitive and is intended as a guide only. East Coast USA 2 weeks. This method can also apply if you are shipping a motor vehicle with your household goods where the combined volume amounts to a full container load. Using specialist equipment the car will be loaded and over-cased with your household goods. GROUPAGE CONTAINER – The alternative to the exclusive container is the groupage container, whereby your belongings share container space with other Abels consignments bound for the same destination, as soon as sufficient volumes are available. Groupage is a cost-effective solution for smaller shipments as you pay only for the container space utilised. Other terms for groupage include consolidation and part load. Transit by groupage container varies typically from and average of 10 to 16 weeks depending on the destination. LESS THAN CONTAINER (LCL) – Consignments destined for countries not served by regular groupage container services are export wrapped and then packed in (heat treated, from sustainable timber sources) sturdy outer plywood cases (lift vans) and delivered to the container terminal for containerisation by our shipping line. This method is known as LCL (less than container load). As bookings can be made for a specific sailing transit times are similar to those by exclusive container. Airfreight has the obvious advantage of speed and is recommended for items that need to be there without delay such as wedding gifts, computers, business clothing and tools of trade. Airfreight can be cost-effective, normally for smaller consignments, particularly those to inland destinations many miles from a container port. Consignments are export packed and loaded into transit modules, waterproofed and security sealed, and transported in the cargo hold of passenger or freight aircraft. Transit time by air is typically between 10 and 14 days, however please be mindful that there are strict security regulations. Sea freight services are available to many European destinations; nevertheless, certain countries may be costly to service via container and transit times can be poor. In this event we recommend our European road service, on an exclusive or part load basis, depending on the quantity of your goods, preferred delivery date and budget. How is my payment to you protected? How much notice to I need to give to book my move? A much notice as possible, during the summer months its best to book at least 4 weeks ahead, during the winter less notice is required. However we can often perform miracles and so please call your Abels Customer Liaison who will be happy to help even with last minute bookings. I am thinking of Owner Packing, what are the pitfalls? Do I need to empty my chest of drawers? If you have you possessions exported from UK to outside of the EU then no VAT will apply. If you are moving from outside of the UK back to the UK (including from an EU country) then no VAT will apply. For customers moving within the UK or from the UK to an EU country in Europe then VAT will be applied at the current rate. 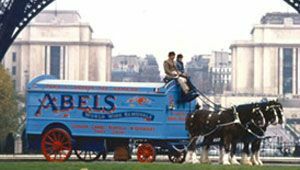 When will Abels Moving Services require payment? We will require a deposit with your confirmation of booking (please see our quotation for details). – For a direct move within the UK or Europe payment is required prior to collection so that we have cleared funds in our bank before delivery is permitted. – For an international move the balance is payable upon receipt of our invoice, following packing. – We accept payment by banker’s draft, personal cheque, credit or debit card. Please note that payment by cheque will require bank clearance prior to shipment. All business is undertaken subject to British Association of Removers contract terms and conditions. For further information please click on terms & conditions. Can you insure my possessions? Every precaution is taken to protect your possessions whilst they are in our care. Nevertheless, it is advisable to protect your belongings for a sum equivalent to replacement value at destination, including the shipping costs and import duty, that may otherwise be payable. Our Marine Transit Insurance covers loss or damage in transit from packing and collection and is valid until delivery to final residence or store, whichever is sooner. If you wish to store your goods at origin or at destination insurance may be extended to cover additional periods in store; please contact your move coordinator to arrange an extension. Our Insurance Proposal form and summary of cover will accompany your quotation. If you need assistance with completing the form please contact us. Please note that should you decline insurance, we will rely upon our terms and conditions.